BSKT is proud to support the ANIMAL WELFARE LEAGUE QLD (AWLQ) with our nifty smart cup initiative. 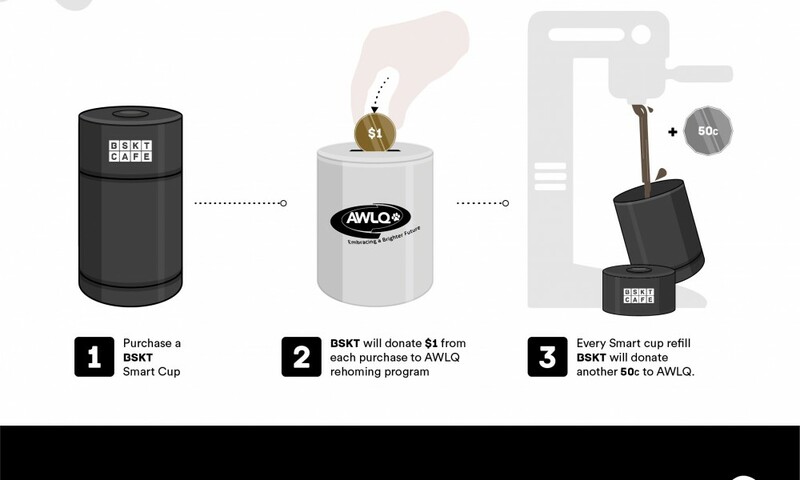 Simply purchase a BSKT Smart Cup and we will give $1 from each purchase to AWLQ rehoming program. With every smart cup refill we will give a further 50c to AWLQ. AWLQ Successfully rehouses an average of 200 animals each week being adopted from state wide Rehoming Centres and Shelters. Even more of a reason to get down to BSKT for a coffee! To mark the the launch of #coffeeforpaws AWLQ will be bringing along 3 of their cutest fury animals with handlers to BSKT on October 6 at 9:30am – 11:30am. There will be also be special giveaways on the day so pop down for a brew and help shelter our furry friends.